One of the UK’s best known university towns, with a very low cost of living – could Nottingham be your start-up city? 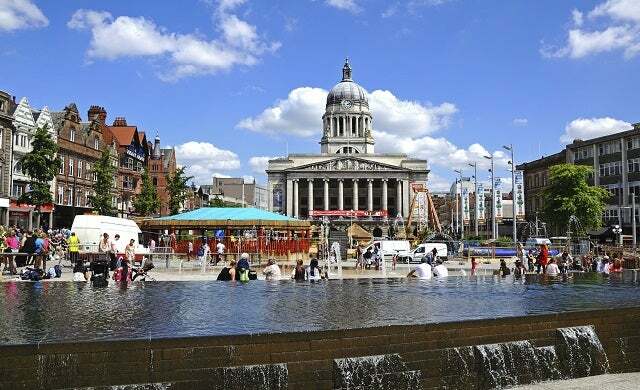 Why start a business in Nottingham? With a rich pedigree in the healthcare sector, a location in the heart of the East Midlands and excellent transport links, Nottingham represents an appealing destination for medical start-ups of all kinds. It is one of just six UK locations officially designated as a Science City, in recognition of its status as a hotbed of world-leading science and technology innovation in research and business. While an appealing location for start-ups, it’s worth noting that Nottingham also serves as a base for corporate brands such as Alliance Boots, Capital One, and Experian. Nottingham’s Enterprise Zone, funded by Boots, is at the heart of this scientific cluster. Offering reduced business rates, relaxed planning restrictions and a mixture of property options, the Zone offers support for businesses in the healthcare, biotechnology, beauty, ICT and green technologies sectors. Located close to the major motorways of the M1, M42 and A1, getting in and out of Nottingham is a simple affair, although getting around the city is a crawl (road speeds average out at just 16mph). The city’s transport links are currently undergoing a £800m overhaul to improve the slow traffic issue, and Nottingham is set for a major boost by 2023 when plans will be put into place to connect it to the new high-speed rail link. East Midlands airport is a 27-minute drive away from the city centre, connecting entrepreneurs with a number of international destinations, and London is just under two hours away by train. Nottingham is one of the UK’s best-known university towns, and boasts two separate institutions – the University of Nottingham and Nottingham Trent. The University of Nottingham is ranked amongst the top 75 universities in the world, and has additional sites in China and Malaysia; start-ups should be able to access a rich and varied pool of talent from the institution. It offers a number of services for business, including knowledge transfer partnerships with scientists and experts and – uniquely – an Asia Business Centre, leveraging the university’s Asian connections to support international business partnerships. Businesses looking for office and laboratory space with close links to the University of Nottingham should consider its Innovation Park – situated next to the university’s Jubilee Campus, it offers a range of office and laboratory space in addition to scope for networking and collaboration with leading academics, graduates and business figures. Access to talent in the city itself is generally comparable to other cities in the East Midlands. 34.4% of the working-age population have NVQ Level 4 qualifications or above, and labour costs are also appealingly low – average median full-time weekly salaries stood at just £448 in 2016 – the third lowest on the index. Nottingham’s Enterprise Zone should offer a great starting point for businesses looking to access office space, support, funding and more. The Boots campus within the Enterprise Zone has plans to become a “UK centre of excellence for health, beauty and wellness” with 113 hectares set to be made available to businesses in these sectors. Space will be available through a mixture of redeveloped existing buildings and around 40 hectares of brownfield development land. Elsewhere in the Enterprise Zone, the Nottingham Science Park is located directly opposite the University of Nottingham and works closely with the institution’s well-regarded research base. The site has a direct link on the tram network to the centre of Nottingham and is designed for science and technology businesses looking for opportunities to ramp up R&D activity. Sites are available from 20,000 sq. ft. upwards. 2016 marked the launch of Energy Research Accelerator (ERA), a collaboration between six midlands universities to research and develop new technologies in energy. It will look to transform the UK’s energy landscape, create jobs and develop skills. Medical sector businesses now have the option of locating in a new Medipark centre, situated opposite the Queens Medical Centre – one of the UK’s largest teaching hospitals. With 40,000 sq m of office and lab space to be made available, the £10m development will feature a tram stop and even a helipad. Development is expected to take place over the next 18 months. Fintech businesses are also supported in the city. In July 2016, credit card company Capital One launched an accelerator programme – Growth Labs – which operates out of the firm’s Nottingham headquarters and offers early-stage fintech start-ups access to its software engineering department and the tech professionals that work there, plus a series of workshops on topics like branding, legal advice, business development and other mentoring activities. Numerous developments are available for businesses in the city centre, and the office market is set to expand rapidly, with 2.5m sq ft of proposed space having been given either outline or detailed planning permission. Co-working space can be found at Nottinghack, for example. Growing Nottingham lists all the latest opportunities for businesses looking to establish themselves and grow in the city, including the Nottingham Investment Fund and the N2 Business Growth Programme, as well asa variety of other programmes to suit different needs. For high-growth businesses based in the region, the £40m Foresight Nottingham Fund provides investments of up to £2m for projects which will create jobs and attract outside investment to the region. Eligible companies will typically have annual turnovers exceeding £100,000, although the Fund does provide some seed backing for start-ups too. Elsewhere, the Creative Quarter of the city centre offers a number of funding and grant programmes to encourage its growing tech and life sciences cluster. The Creative Quarter Loan Fund provides amounts from £500 to £25,000 at a preferential interest rate of 6% (with a 2% arrangement fee) to new start-ups and existing businesses based in the area; these are repaid over a period of five years. Nottingham city is fairly compact and set in the appealing surroundings of Nottinghamshire home to Sherwood Forest of Robin Hood fame. The area has a high number of historical attractions, including Nottingham Castle, the Ice Age drawings at Creswell Crags and the perfectly-preserved Elizabethan stately home of Hardwick Hall. For outdoor types, Nottinghamshire has no end of diversions, with adventure sports available in the aforementioned Sherwood Forest and an impressive network of caves. There are also a number of country parks and nature trails. Nottingham city itself has suffered from an unfortunate reputation as being somewhat crime-ridden, and indeed crime is high for a small city, at 102.02 crimes per 1,000 population. This makes the city more dangerous than Liverpool, Norwich and the nearby city of Leicester, but safer than Plymouth, Manchester and Southampton. The trade-off is that house prices are relatively low at £162,136 so offer an affordable base for start-up founders. A first-hand account from an early-stage start-up on what it’s like to start a business in Nottingham and what the city has to offer new entrepreneurs. You can also gauge insider opinion on what more Nottingham needs to do to accommodate start-ups.